In order to evaluate your case appropriately, please set aside sufficient time for your appointment. Depending on the findings, the first visit is usually 45 minutes to an hour. Welcome to our comfortable office! When you arrive at our practice, you’ll find plenty of convenient, well-lit parking. You will be kindly welcomed with a warm greeting and a smile from one of our cheerful chiropractic assistants. 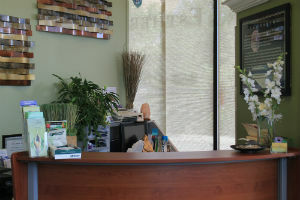 New patients often state that our office has a “relaxing, comfortable atmosphere”. We will do everything we can so you have a pleasant experience. You will then be invited to fill out our new patient paperwork, if you haven’t already done so from our website. If you complete the necessary forms prior to your arrival, you will have a minimal wait time before meeting privately with Dr. Jimenez. Please know one of our team members will assist you in completing the forms, if necessary. We are here to serve you. Prior to meeting Dr. Jimenez, we would like to provide you with a tour of our office so you can be better acquainted. The tour ends with a short 5 minute educational video which will prepare you to have a one-on-one consultation with Dr. Jimenez. She will warmly greet you and continue by referring to your completed case history questionnaire and medical history. Dr. Jimenez will listen intently to your case, take notes and get a better understanding of the reasons why you seek chiropractic care. If you are a chiropractic candidate, Dr. Jimenez will conduct a thorough chiropractic, orthopedic, neurological examination, which may include a Heart Rate Variability test and/or InsightTM Subluxation Station Scan. If deemed clinically necessary, she will continue by take x-rays to further evaluate your case. Don’t worry! The x-rays are taken on premises. Our aim is to fully understand where your health is now and where do you want it to be in the future. Patients appreciate that we explain everything in advance! The purpose of these examination procedures are to locate Vertebral Subluxations and other clinical information that will suggest an appropriate chiropractic care plan that will best help you or your child. Dr. Jimenez will develop a personalized care plan to help you reach your highest health potential. The goal is to regain your health as quickly as possible! Our supportive staff will then coordinate a follow up visit known as the Report of Findings visit. On this visit, Dr. Jimenez will report on her findings from your first appointment. A personalized road map will be created for you to get where you want to be in regards to your health. We’ll discuss whether our office is the right place for you. If not, we’ll refer you to an appropriate provider who can help you. We’ll also discuss your financial obligations based on your insurance coverage. The Report of Findings visit usually takes 30-45 minutes. Subsequent visits will take approximately 10-15 minutes each. As a thermal scan that identifies heat signals, showing how long the problem will take to release and stabilize. We’ll check how your body is healing. At this time, if anything needs to be added to your program or if you require different types of adjustments to achieve your next set of goals, changes will be made. An individualized program of care will give you exactly what you need in order to reach better health. *Unfortunately, if you are more than 10 minutes late and arrive without completed forms, we may ask you to reschedule your visit in order to respect everyone’s time, including other clients reserved appointments. It’s our goal to avoid anyone from feeling rushed or that substandard care was provided. If you’ve been to other chiropractors without results, contact LifeSpa Chiropractic & Wellness. We have helped many families who have arrived without hope and have left seeing results!